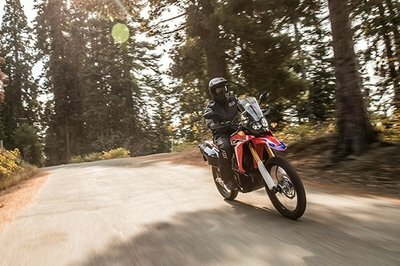 Honda’s CRF series has been around since MY13, and 2017 sees the first major update for the family. Among the changes, the factory added another 1.6 horsepower over the previous generation, and it added the “Rally” to the lineup for even more capacity for fun when the blacktop turns to brown. These rides are built for people who take their fun seriously, according to the factory, but just how serious you can get with one depends on your definition of the word. Is it a machine that will suit your purposes? Let’s take a look and find out. 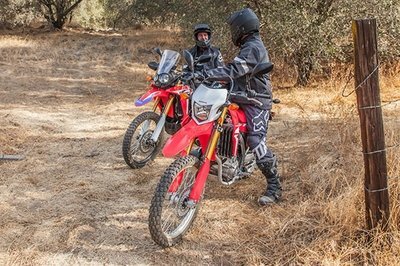 Continue reading for my look at the Honda CRF250L and CRF250L Rally. The dual-sport/mini-adventure 250 joins Honda’s XR650L as part of the Red Rider’s bid to capture that market sector. In general, the DS genre has improved significantly over its initial, glorified-dirtbike origins, and it was a relatively quick evolution to boot. The arms race for DS supremacy is in full swing with every manufacturer looking for an edge or advantage to exploit, and it’s just that sort of competition that drove the factory to bring us this updated and expanded family. The CRF250L layout and look is the very epitome of what a dual sport should look like. A triple-clamp mounted mudguard leads the way above formed shields that protect the swept inner fork tubes from impact and grit, and that, in turn, protects the seals in the usd front forks. A compact flyscreen houses the headlight and shields the instruments on the base model 250L, while the Rally carries a clear windshield with asymmetrical headlights set in the bottom, and instrument risers that place the clocks in a more visible position, particularly in the standing-on-the-pegs riding posture. From there, the “L” sports an abbreviated cowling that protects the sides of the radiator but leaves the rest of the powerplant and frame readily visible, especially when viewed in profile. The Rally takes a little bit of a different tack and goes with a more complete, Dakar Rally-inspired set of body panels that just leave a tantalizing glimpse of the cases, and little else. Not only does this make the Rally look like serious business, but it provides some real-world protection for actually digging into some scrubby terrain. Continuing on, we have the typical, dirtbike-style bench seat that leaves plenty of room to shift weight fore and aft as needed, and with fold-up footpegs mounted on the subframe, leaves one with the possibility of carrying a passenger. A tucked-away exhaust system helps keep weight centralized up until the very end, at which point the shielded muffler peeks out from under the subframe just enough to keep clear of the tagholder mudguard. Small, bullet-type turn signals and a tucked-away taillight finish off the street-legal lighting. Alongside the improved appearance in the form of better graphics and body components, 2017 sees numerous little changes that add up to a whole lot of difference from last year, including better throttle response, better power in low and midranges, reduced vibration, and reduced unsprung weight. These bikes are meant to be used in difficult terrain, and the factory took steps to help them stand up to the punishment. A steel frame forms the bedrock upon which the rest of the bike is built with a good, old-fashioned, yoke-style swingarm to finish it off. Steering geometry sees a bit of a difference here with the L measuring out at 27.6 degrees of caster and the Rally clocking in with 28.1 degrees. Naturally, this affects the trail a bit with the L at 4.4-inches and Rally at 4.5-inches, and the wheelbase as well with 56.9-inches and 57.3-inches, respectively. 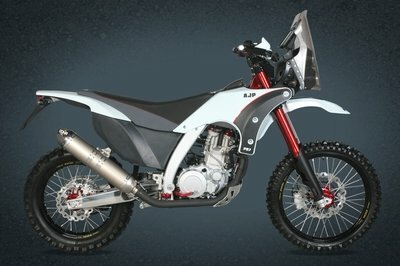 Taller suspension components on the Rally — forks 30 mm longer than standard — bump the seat height up to a lofty 35.2-inches tall, almost a whole inch taller than the L, and with it comes an increased, 11-inch throw versus the 9.8 inches of travel on the L. The Pro-Link monoshock gives up 10.3 inches of travel for another advantage over the L’s, 9.4-inch range of motion. Neither model enjoys any sort of adjustment up front, and only provide the obligatory spring-preload adjustment in back. Gotta say I’m a little disappointed that the Rally doesn’t get some gravy up front with some adjustability. Maybe next year? The brakes likewise see some differences with the Rally running a larger, 296 mm single disc up front versus the 256 mm disc on the L, but both run a 220 mm in back. An optional ABS feature is available for both models, though the Rally version can be switched off — but for the rear brakes only. This may feel a little unnatural to experienced dirt riders, but I suppose it’s something you’ll have to learn to deal with. Something else that will take some getting used to is the tendency of the suspension to bottom out on terrain; even the seemingly off-road-tastic Rally can’t handle as much as one might have hoped, but there’s always the aftermarket if it really bothers you. Same with the tires. Road knobbies come stock, but depending on how you plan to use it, you might want to take a look at more specialized tires, because in this case, a Jack-of-all truly is a master-of-none. The powerplant from the previous generation makes the transition, but not in its entirety. For 2017, throttle-body diameter was bumped up to 38 mm and the airbox got tweaked to open up the top of the circuit while the exhaust header and muffler were enlarged to free up the bottom for an overall lower resistance to flow and better power generation. Just how much, you ask? Power output tops out at 24.4 ponies, and while that’s only a marginal increase over the 22.8 ponies from last year, it’s an increase. Computer-controlled ignition and fuel injection manages the thumper to help it meet emissions standards. Mileage on the improved mill is yet to be determined, but the previous version managed around 73 mpg and I expect the new one to be in that same ballpark. Dual over-head cams time the four-valve head, and a 10.7-to-1 compression ratio calls for mid-grade fuel. Power flows through the six-speed transmission, then to the rear wheel via chain drive. 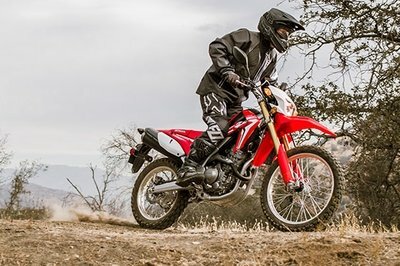 You can score a ’17 CRF250L for the everyday low price of $5,149 for the base model, and $5,449 for the ABS version. As you might imagine, the Rally commands a higher ticket with a $5,899 for the standard and $6,199 if you want ABS. 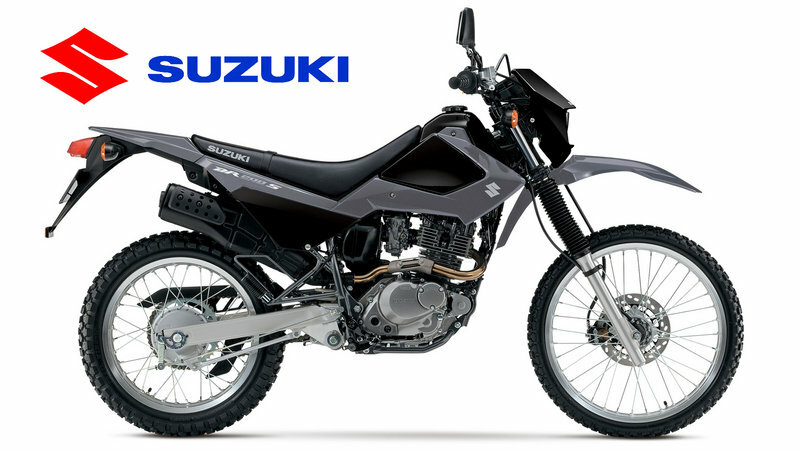 Just about every manufacturer involved in dirtbikes is also in the dual-sport game as well and there is no shortage of potential competitors out there, so I’m going to take a look at Suzuki’s popular little DR200S today to see how well these neighbors stack up. 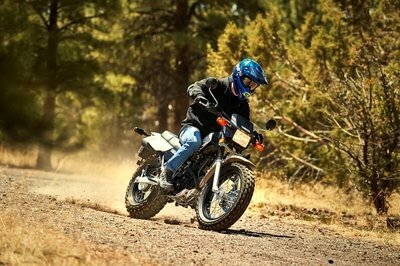 Since dual-sport rides are such purpose-built machines, they necessarily follow similar designs across the board. Clamp-mount front fenders and mini-flyscreen headlight cans lead the way like two sides of the same coin. Neither carries much in the way of body panels, so the engines are well visible with little left to the imagination. The air-cooled DR is a bit cleaner looking without the radiator cluttering things up, but from there back they both have similar tank profiles, bench seats and tag-holder mudguards to finish out the flylines. Rather than trying to use the muffler as some sort of design component, Suzuki discreetly tucks the blackout muffler and heat shield in where it can do it’s work from a more behind-the-scenes position. Another minor difference between the two here involves the fuel tank; namely that the Honda carries 2.1-gallons while the Suzuki shows some longer legs with a 3.3-gallon tank. This makes for a much longer range, especially given the 88 mpg efficiency rating enjoyed by the DR, which makes it more suitable for long-distance adventures in that respect. Both start out on steel pipe frames, but while the CRF250L front end floats on a pair of inverted forks, Suzuki kicks it old-school with a set of standard forks and bellow gaiters to protect the swept area of the inner fork tube. That said, neither come with any sort of adjustment up front, and so Honda gains an edge by virtue of its tougher front suspension arrangement. The Red Riders get another bump with their brakes. Both ends of the Honda ride comes with hydraulic discs and can be had with ABS if you so desire, but Suzuki decided to keep a rear drum on the DR with no ABS protection available. Since I’m not what you would call a huge fan of drum brakes, I’m calling that another point for Honda. Suzuki powers the DR200S with a 199 cc, air-cooled thumper that falls just a handful of cubes short of the 249.6 cc mill in the CRF, and the power figures reflect that. 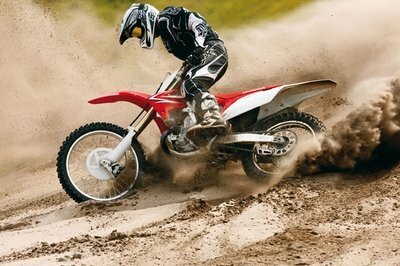 Honda enjoys a total of 24.4 horsepower from its CRF250 engine with the DR close behind with an even 20 ponies. When you consider the Honda weighs in at 317-pounds wet versus 278 pounds with the Suzuki, that power difference doesn’t register on the heinie-dyno quite as decisively as one might imagine. Plus, let’s face it; they’re both little funbikes that are never liable to see a racetrack, so a little performance difference is not going to be a deal breaker here. Suzuki’s biggest win here is at the checkout. 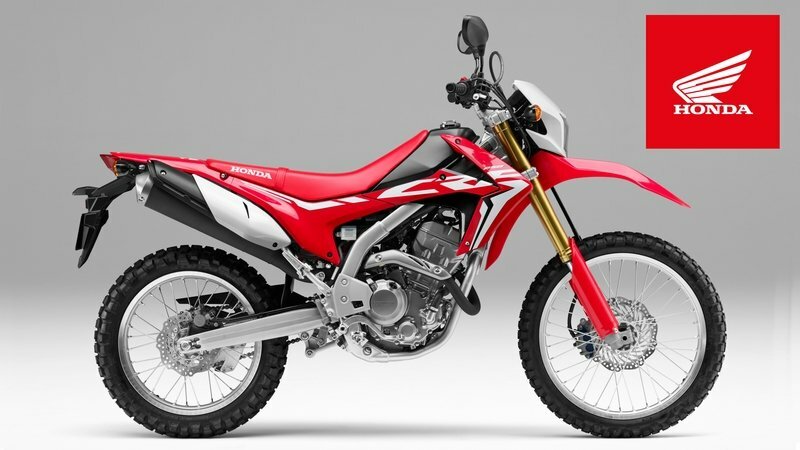 The DR200S rolls for a mere $4,499 while the CRF250L commands a $5,149 price tag. This difference is likely to buy Suzuki some business, since bikes like this aren’t exactly heirloom pieces and don’t exactly need to last for generations, if ya know what I mean. 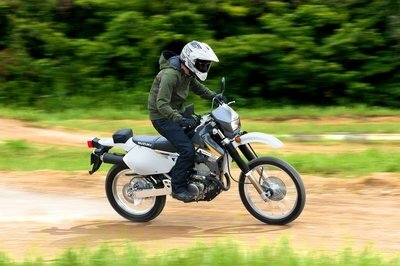 My wife and fellow motorcycle writer, Allyn Hinton, says, "With its enhanced off-road capability, the Rally is much more dual-sport-ish than its plain-Jane little sibling. I like the longer suspension travel and overall better off-road-worthiness, however it is still rather tame for a trail bike. 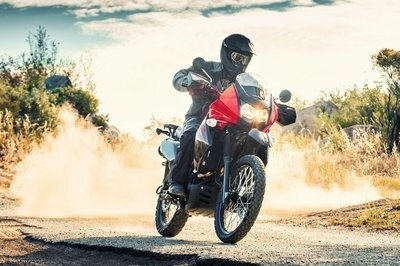 As a competitor, I might go with an XT250 from Yamaha as far as a direct comparison. 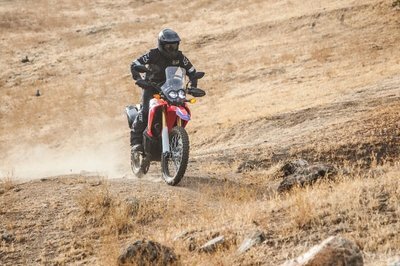 The CRF250L is more nimble than a big adventure bike, but obviously less power and less highway-worthy. I’m not saying it’s a bad thing, just sayin’ that it is." Seat Height: 34.4 in. 35.2 in. Ground Clearance: 10 in. 10.6 in. Wheelbase 56.9 in. 57.3 in. Fuel Capacity 2.1 gal. 2.7 gal.